It is immediately obvious to the naked eye that SubBoomBass 2’s GUI (Graphical User Interface) is on the receiving end of a musical makeover making for more comfortable control of all its fanciful features. Fortunately for fans of the original soft synth, SubBoomBass 2 retains its much-loved modelled analogue waveform-driven warmth, but brings into being a brave new world of new sound colours courtesy of supplemental spectrum waveforms, with high-quality thinking outside of the box-style samples sitting alongside a welcome inclusion of Karplus-Strong string synthesis — a method of physical modelling synthesis that loops a short waveform through a filtered delay line to simulate the sound of a hammered or plucked string or some types of percussion. Put it this way: with so much musical firepower placed at adventurous users’ fingertips, SubBoomBass 2 surely sets loose some seriously fresh-sounding and hitherto unheard sounds… above and beyond the (arguably) restrictive realms of dance production with which SubBoomBass first found its musical mark so beautifully. But, Rob Papen being Rob Papen, there is so much more to SubBoomBass 2 than might first meet the eye… enter an X/Y screen (which will already be familiar to owners of the company’s critically-acclaimed BLUE-II and RAW soft synths both designed differently for different musical motivation in mind); access an all-new SEQUENCER (capable of running four patterns); plus an easy-to-use BANK MANAGER (with ‘star’ feature for speedily searching for favourites — whether user-created or one of the trademark Rob Papen professionally-programmed presets presented in their thousands). Speaking of which, all of the original SubBoomBass (sometimes) bass-heavy presets are all present and accounted for, so SubBoomBass 2 can capably boom and shake-shake-shake the room with the very best — bigger and better than its predecessor, possibly! SubBoomBass 2 allows anyone to creatively compliment any style of contemporary music at any time — whether working on video game or film scores, or anything in between and beyond. After all, fellow high-flying Dutchman and original SubBoomBass supporter Tom Holkenberg (a.k.a. Junkie XL) started out on the dance floor, fraternising with worldwide chart positions, and ended up on the big screen as a hotshot Hollywood film scorer. 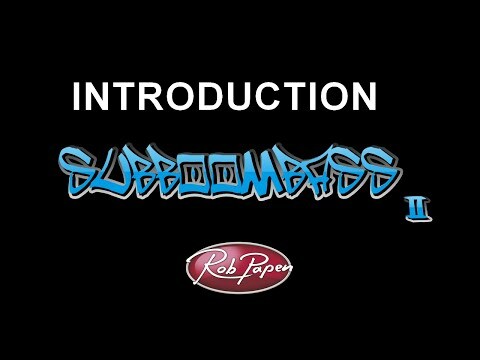 Similarly, SubBoomBass 2 is surely set to become another success story for Rob Papen. Anything is possible… just ask Junkie XL!